Why do hummingbirds fight over the feeder? You would think that these dainty little beauties would be nice to one another but not when it comes to their territory. Hummingbirds are very territorial, especially the males, but the females can be just as aggressive. They are defending their feeding and nesting area (about an area up to one quarter of an acre). Males select an area that has the most abundance of food (insects, tree sap, pollen, and nectar) and water for bathing and drinking. That is reason enough to defend their territory as well as for protecting their young. Currently, we have two pairs of Ruby-throated Hummingbirds that come in to our feeder and every so often you will see a male chasing another male or a female away from a feeder. In fact, I have seen one of the males stand guard as it perches in the river birch near the feeder just waiting to chase any intruding hummingbirds away from his food. This usually happens in the spring during breeding season. Then come around late July until about September, when more hummingbirds show up from up north as they begin to migrate, there will be more of this aggressive behavior. Males as well as females will be fighting over the feeder and chasing each other around the garden. The hummingbirds need extra energy to survive the long journey back to South America and will defend their food supply at all costs. Can they hurt each other when they do this? It is rare for a hummingbird to get hurt as I have never seen it, but apparently some say it does happen. There are a few ways to alleviate the fighting if this concerns you. You can place more than one hummingbird feeder in your yard so that hummingbirds have more options for getting nectar. If you are like me the more hummingbirds the better so you don’t want to turn any away because of a bully hummer. This is why we have six feeders, five of them are located in different places in our backyard and there is one in the front garden. They don’t have to be the big kind either, we have four hummingbird feeders that are smaller that work perfectly. Added Note: Having more than one feeder does alleviate some of the fighting. Plus, we have found that over time, we are getting more hummingbirds to our yard now because of the number of feeders. Hummingbirds have a good memory when it comes to finding nectar and will generally return to the same place each year. Another option is to have more than one hummingbird feeder kept in clusters close to one another (as seen in the video above from Cheryl’s Frenzy in Valley Center, California). I have never done this but people claim that this keeps the fighting down too. A dominant hummingbird cannot guard all of the feeders at the same time and consequently keeps the aggressive behavior at bay. Of course providing plenty of flowers and bushes that attract hummingbirds helps too. 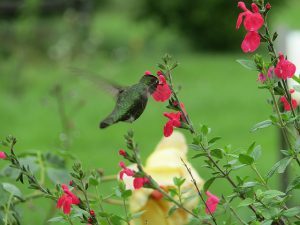 Hummingbirds like to drink the nectar from flowers and bushes such as the Butterfly Bush, Lantana, Mimosa, Flowering Quince, non-invasive Honeysuckle, Bee Balm, Cardinal Flowers, Foxglove, Penstemon, Mandevilla, Million Bells, Impatiens, Petunias, and Jewel Weed, just to name a few. If you have a few of these types of flowers or bushes in your yard, hummingbirds will have another place to get food besides the nectar feeder and won’t need to fight for food. Hummingbirds are very territorial when it comes to protecting their food supply and their nests. In the spring time they can be pretty aggressive at the feeders towards other hummers invading their space. 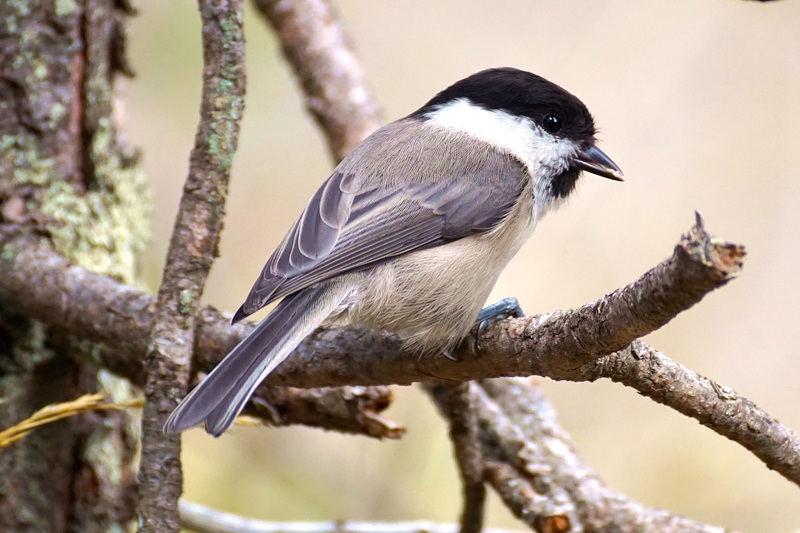 They may perch in a nearby tree as they guard a feeder just waiting for another hummingbird to try to take some nectar. That is when the chasing begins or the fighting. Honestly, this is just great entertainment to me. I could sit outside for hours watching the hummingbirds in action. There are ways to alleviate some of the aggressive behavior if you are concerned. 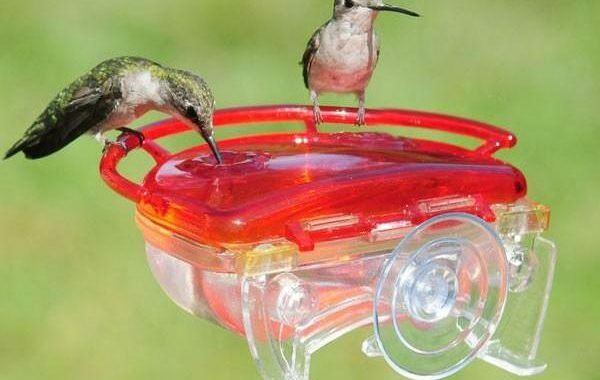 If you place more than one hummingbird feeder throughout your yard the hummingbirds will have another option if one of the feeders is under guard. It is not going to cut out the fighting or chasing completely but it does help. 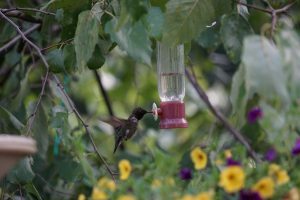 Plus, the bonus of having more than one feeder (maybe two or three or more), eventually attracts more hummingbirds to your yard. Note: Feeders should be out of the direct sunlight and in a somewhat secluded spot as hummingbirds prefer this. 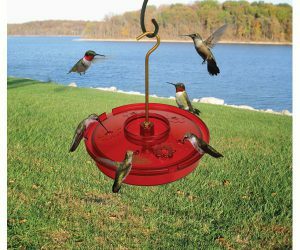 Or you can put your hummingbird feeders in clusters close to one another so that a dominant hummingbird cannot keep up with guarding more than one feeder at a time. An added bonus for hummingbirds is to provide plenty of nectar loving flowers and bushes such as a Butterfly Bush, Petunias, Million Bells, Impatiens, and Bee Balm. That way hummingbirds have more options besides your nectar feeder where they might get chased away. Let me know what works for you with hummingbirds in your garden. It would be great to hear from you. Please feel free to make your comments below. Posted in Attracting Hummingbirds, Hummingbirds and tagged hummingbird feeders, hummingbirds. ← What Is A Killdeer?